Residents walk in a street as others queue outside a bank in Harare, Nov. 15, 2017. Zimbabwe hovers in a state of uncertainty after the nation’s army moved on the capital Tuesday. After nearly four decades in office, President Robert Mugabe appears to have finally gone too far in firing his vice president and positioning his wife to succeed him. No one saw it coming, and yet, everyone saw it coming. For at least a decade, Zimbabwe’s standards of living have been sliding — its economy is in shambles, its health system in tatters, its elections discredited, its infrastructure a shadow of the promise the nation held when it gained independence in 1980. 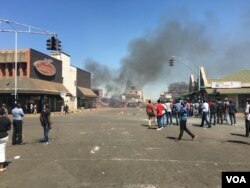 FILE - Protests are set to return to streets of Harare over proposed bondnotes following the expiration of a police month-long ban of demonstrations, Harare, Zimbabwe, Aug. 26, 2016. (S. Mhofu). In recent years, protest movements came and went, journalists spoke up and were silenced, and nearly a million of citizens claimed political asylum in neighboring South Africa. But throughout that, it appeared that nothing would challenge the supremacy of the only leader Zimbabwe has ever known, President Robert Mugabe. FILE - Zimbabwe's President Robert Mugabe, left, and his wife Grace chant the party's slogan during a solidarity rally in Harare, Wednesday, Nov. 8, 2017. 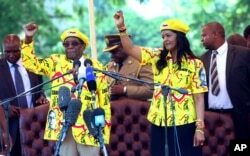 But then, when the aging president fired his deputy and indicated that he would replace him with his unpopular wife, Grace Mugabe, the head of the armed forces warned he would "step in" unless Mugabe stopped trying to purge the ruling party of supporters of the ousted vice president. That, says analyst Piers Pigou of the International Crisis Group, was the tipping point. FILE - In this image taken Feb, 10, 2016, Zimbabwean Deputy President Emmerson Mnangagwa greets party supporters at the ZANU-PF headquarters in Harare. It is now clear that General Constantino Chiwenga was not bluffing. 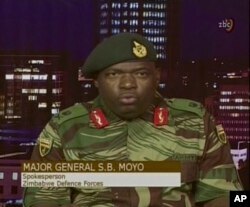 After tanks were seen rumbling through Harare on Tuesday, soldiers took over state TV in the wee hours of Wednesday, and army spokesman Major General SB Moyo delivered this stunning statement. “R.G Mugabe and his family are safe and sound and their security is guaranteed. We are only targeting criminals around him who are committing crimes that are causing social and economic suffering in the country in order to bring them to justice,” he said. But the drama may be just beginning. Zimbabwe’s ruling party said on social media that Mnangagwa will return and take the helm, as, they say, the Constitution provides. 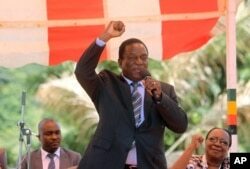 But Pigou says a change in leadership will not, on its own, solve Zimbabwe’s woes. And, of course, everyone is wondering what will come of the power couple at the heart of this drama. Few analysts think that Mugabe and his wife will themselves face the retributive rage of the Zimbabwean people. Analyst Alex Magaisa of the University of Kent predicts a soft landing for them, but thinks that Mugabe’s longtime cheerleaders are in for a tough time. “Perhaps they might have to leave the country in order to avoid having that pocket of power, which would be challenging. But I think those who were aligned to the first family, to President Mugabe and his wife, I think they are the ones who are going to face the brunt of the new regime,” he said. For years, “MUGABE IS RIGHT” was the rallying cry of Zimbabwe’s powerful elite. Those who questioned the powerful leader were vilified or punished. But now, with Zimbabwe’s strongman suddenly silent, the questions are mounting.